... for an easy to make chicken curry. I told a friend I was making this dish a few weeks ago and she asked for the recipe. Figured I'd share it with all of you readers of crazy Zee's blog! Okay, so there's nothing exactly spectacular about my chicken curry, except maybe if you're not used to eating chilli, 'coz mine would probably liquefy your oesophagus, stomach, intestines and guts. Yup, we're heavy on chilli here! But on the whole, this dish is easy to make, speedy, and keeps very well for 2 days in the fridge (make sure the dish is cooled before putting it in the fridge) and can even be frozen and eaten at a later date. - Onions, finely chopped - the more, the thicker your curry. I use about 3-4 closed-fist sized onions. - Potatoes, diced. Use however much you want, I don't keep tabs on how many I add to this dish. - Curry powder, about 2-3 Tablespoons - any good grocery store carry these. I know Shaan brand is available in the US - just be very careful with this brand coz it's loaded with chilli. Try going for a mild or chilli-free version if you're not used to Indian food. 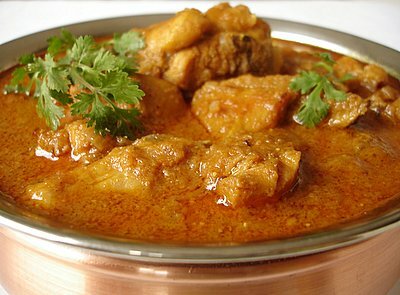 - Gram flour - 2-3 Tablespoons again - this is what will thicken your curry. It's available in all good Indian stores, under the name of Besan. If you don't get this, you can use chickpea flour. - Salt - check to see if your curry powder is already salted. - Crushed tomatoes or tomato paste/puree - about 2 Tablespoons. - Oil for cooking - a good vegetable oil such as soya or sunflower. Olive oil is not indicated for this recipe. - Fresh coriander (cilantro, as I think it is called in the US) - chopped, for garnish. - Heat oil in a deep, thick metal pan. Add chopped onions, fry until onions start turning brown. - Mix curry powder, gram flour, salt and pepper in a small bowl. Add a little water to make into a paste. Add paste to fried onions pan. - Cook, stirring all the time (or else the flour will make it stick, and keep flame on medium), until the oil separates from the paste. Add a few drops of water if the paste is sticking to the base of the pan. - Add chicken pieces, stir to coat with massala (which is what the paste is called!). Add water, usually just enough to cover chicken pieces, and stir. - Add diced potatoes (add more water to cover potatoes and chicken if necessary. This will ensure that the food doesn't dry out so the massala doesn't stick to the pan and get burnt). Close pan with lid, bring to a boil, lower heat slightly. Let cook for 15-20 minutes. - Remove lid, stir to check if potatoes are cooked (smash one cube against the side of the pan with the back of a wooden spoon. If it smashes easily, it is done). - Add tomato paste/puree (this softens the massala). Stir, let cook uncovered for 5-10 minutes. - Turn off heat. Garnish with chopped coriander. - Serve hot with rice, naan (Indian yeast bread), or chappatis (Indian flat bread cooked on a hot griddle). I hope you'll enjoy this recipe. It's a staple of my kitchen, and I don't get away from this deal without making chappatis! Lol, you made it! Yuppie, that was for you, lovely!